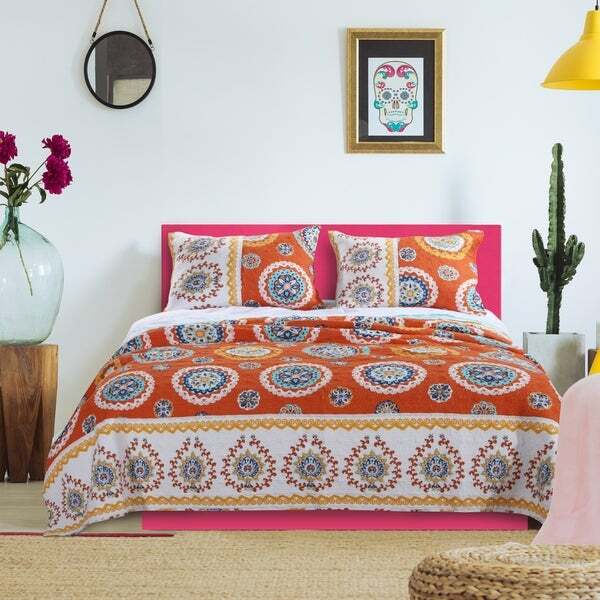 Add a playful, vibrant mood to your room with this richly colored medallion coverlet set. Inspired by parlor room art from the 1960's and featuring spiral quilting, this bordered bedding reverses to a fishnet print in aquamarine. Oversized for better coverage on today's deeper mattresses. Prewashed with extra softener for a silky feel. Machine quilted with fabric bound edges for durability and surface interest. Quilt set comes with quilt and two pillow shams (one sham per Twin set). Dimensions: Twin set includes one 68x88" quilt plus one 20x26" pillow sham, Full/Queen set includes one 90x90" quilt plus two 20x26" pillow shams, King set includes one 105x95" quilt plus two 20x36" pillow shams. Dimensions +/- 2". Machine Wash. 100% Microfiber polyester shell with cotton-rich - 60% cotton, 40% polyester - fill. Imported. love this light weight summer quilt. just what i wanted. I was hoping to find a coral colored quilt, not orange, but the colors on this are not overwhelming. I often use twin size quilts on my patio tables in the Summer. Currently, I have a lot of Spanish pottery on my patio so hopefully this will work out. And, the price was awesome. I will use the pillow cover on a couch pillow or small table top. Voila’! style!